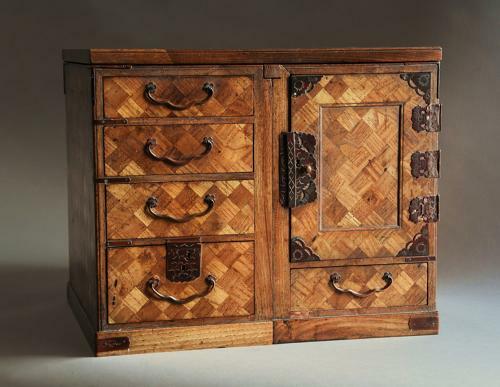 This scholars box consists of parquetry decoration (geometric wooden inlay) of various woods with metal handles and hinges. The box consists of a lid that opens up to reveal two separate sections (as can be seen on the photographs), one having four drawers, the other having a door with two drawers within and a drawer below - these sections can be separated or kept as one single box. The scholars box was particularly used in Japan to store brushes, inkstones and items used for calligraphy - this box would be ideal storage for jewellery or for other small items. This box is in very good condition for age, is of stable construction and can go straight into a home.